LDS Church leaders discussed building a temple in the western part of Idaho as early as 1939. 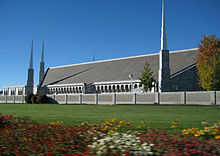 However, with the majority of church's membership in the eastern part of Idaho, the leaders decided against it and concentrated on building the Idaho Falls Idaho Temple. Coordinates: 43°35′36.68279″N 116°16′30.12240″W﻿ / ﻿43.5935229972°N 116.2750340000°W﻿ / 43.5935229972; -116.2750340000 The Boise Idaho Temple is the 29th constructed and 27th operating temple of The Church of Jesus Christ of Latter-day Saints (LDS Church). The temple is located in the city of Boise, Idaho. Forty-five years later, on March 31, 1982, church leaders announced that a temple would be built in the Boise area. The temple site is located near an exit from Interstate 84 and is very visible to those traveling along the highway and is also a visible landmark for pilots at Boise Airport. In 1984, 70,000 visitors were expected to tour the temple during the nineteen-day open house. Instead, over 128,000 attended. The open house brought an increased interest in the church. The Boise Idaho Temple was dedicated May 25, 1984 by Gordon B. Hinckley. After the dedication, attendance at the temple was much higher than expected. As a result, in October 1986, the temple was closed for renovation. After reopening in 1987, the temple was able to serve more than 100,000 members in southwestern Idaho and part of eastern Oregon. The Boise Idaho Temple has a total of 35,325 square feet (3,281.8 m2), four ordinance rooms, and four sealing rooms. It was built with a sloping roof & six-spire design. The temple closed on July 11, 2011 for extensive renovations and was rededicated on November 18, 2012 by Thomas S. Monson. Preceding the rededication an open house was held between October 13 and November 10, excluding Sundays. The renovation included work on the heating and cooling systems and a reconfiguration of the floor plan to make it more efficient. Most visibly, the marble tiles that covered the temple were removed and replaced with gray granite tiles. ^ a b "Boise Temple To Be Closed For Renovation", Newsroom (Press release), LDS Church, May 20, 2011, retrieved October 26, 2012 . ^ a b Satterfield, Rick, Boise Idaho Temple, LDSChurchTemples.com, archived from the original on October 25, 2012, retrieved October 26, 2012 . ^ Staff (November 19, 2012), "President Thomas Monson dedicates Boise Idaho Temple", Idaho Press-Tribune, retrieved November 26, 2012 . ^ "Boise Idaho Temple Open House, Rededication Dates Announced", Newsroom (News Release), LDS Church, retrieved October 26, 2012 . ^ Roberts, Bill (October 10, 2012), "Inside the Mormons' sacred space in Boise", Idaho Statesman, retrieved October 26, 2012 . ^ Funk, John (October 11, 2012), "Temple Opens Doors: Boise LDS landmark renovated, will reopen in November", Idaho Press-Tribune, retrieved October 26, 2012 . ^ Corr, Justin (October 13, 2012), Thousands tour renovated LDS temple, KTVB, archived from the original on October 17, 2012, retrieved October 26, 2012 . ^ Christensen, Glenna (July 21, 2012), "Renovation of LDS Boise temple will be completed soon", Idaho Statesman, archived from the original (NewsBank) on July 21, 2012, (Subscription required (help)) Cite uses deprecated parameter |subscription= (help).